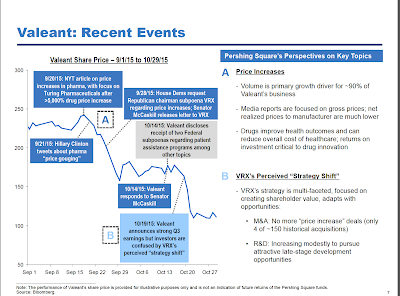 Bill Ackman gave a presentation on Valeant (NYSE:VRX) and its relationship with Philidor on 30 October 2015. Most people remember the presentation because it went for four hours. It also states that there will be "no more “price increase” deals and that price increase deals were only four out of approximately 150 historical acquisitions. ...And then if you could quantify a little bit how much was price versus volume that contributed to growth in 1Q? And what do you factor in your full-year guidance price versus volume? In terms of price volume, actually volume was greater than price in terms of our growth. Outside the United States it's all volume. In fact, we had negative price outside the US with FX. And in the US it's shifting more to volume than price, and we expect that to continue with our launch brands. A lot of our prices for most of our products are negotiated with managed care. And there's only a limited amount of price that we can take. And then if you look at our consumer business, very little. Walmart doesn't like price increases. If you look at our contact lens business, we're not discounting contact lenses. We are keeping the prices the same. I think there is some noise in the market that there's discounting going on. We're not discounting, but that's all volume growth. And similarly in the cataract surgery market, again, we're just holding our prices. So it's primarily volume, and we expect that to continue. You see everything that Bill Ackman said was consistent with what Mike Pearson was saying. Alas it is not true! 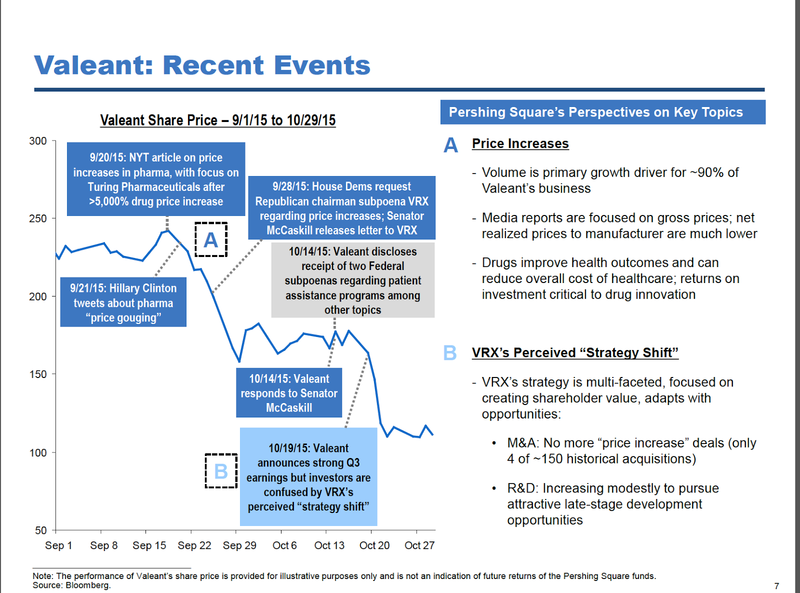 Today we got an insight into Valeant's price and volume strategy and it categorically demonstrates that Pershing Square's perspective (as quoted above) is false. 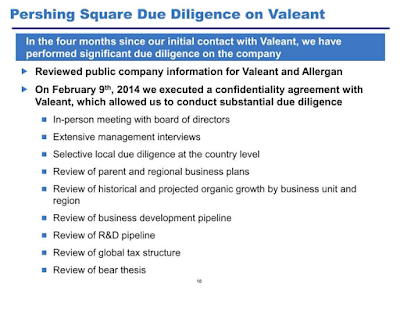 The source is a summary of Valeant's documents given in response to Congressional subpoenas. You see Mike Pearson apparently knew that growth was driven by price. If you include Marathon (the Nitropress and Isuprel acquisition) price represented 80 percent of volume. And that was an email from Howard Schiller (current acting CEO) to Mike Pearson (now CEO). Mike Pearson lied in the conference call. This seems beyond dispute. Just compare the quotes. Moreover the Congressional documents show that multiple acquisitions have been driven by a pricing strategy. 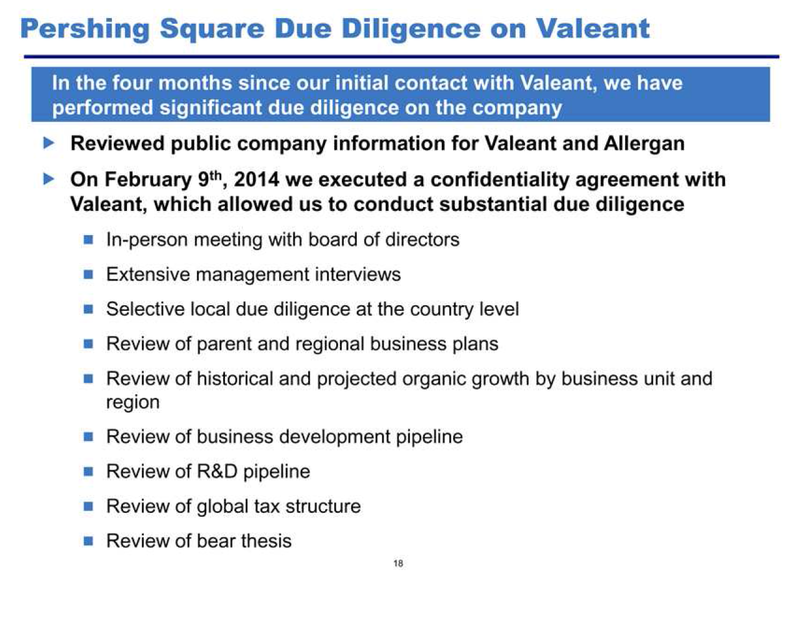 Bill Ackman said that "price increase deals" were a minor part of Valeant's strategy. He has been proven wrong. I do not think Mr Ackman was deliberately wrong. Mike Pearson misled the world in the first quarter conference call (and in other conference calls). Mr Ackman was wrong because Mike Pearson misled him. And that is understandable. Mike Pearson convinced many people. So Bill, you told the world untruths, but they were not deliberate. Mike fooled you. Some may ask why I picked on Pershing Square as the victim of Mike Pearson's apparent deceptions. After all Ruane, Cuniff & Goldfarb, T. Rowe Price, ValueAct Capital Management, Viking Global, Paulson & Co. and an ambush of Tiger Cubs are major Valeant holders. a review of historical and projected organic growth by business unit and region. (b) Mr Ackman thought he was telling the truth when he said that volume, not price was the driver. But he thought that because the company systematically misled him. The deception came not only from Mr Pearson but was repeated throughout "extensive management interviews". And if Mr Ackman thought he was telling the truth and he was systematically misled it is pretty obvious what he must do. He must sell his stock. He owns lots of Valeant stock. If he keeps his stock now he is stating loudly and clearly that it is acceptable for him to invest 30 percent of his clients' money in a company which systematically misled him not just at CEO level but during "extensive management interviews". Pershing Square surely cares more about the investment process than that. Great article... Jury is still out on Bill... But so far seems Pearson is the con man. Ackman needs to sue Valeant and Michael Pearson. Valeant’s business model exemplifies the worst of what passes for entrepreneurship in the 21st century. There is no value-added. Worse, in the words of Charlie Munger, Valeant’s practices are ‘Deeply immoral.’ America is slowly being strangled by healthcare costs, and practices like those at Valeant are at the forefront as to the reasons why. What a shot. I totally admire John Hempton's communication. No excuses for ambitious Bill. Fascinating stuff. Have you been watching the VRX puts? The June 60's puts are trading around 4 and today traded 2669 contracts.Pretty much all of the very far OTM puts trade actively and at prices that only make sense if the stock gets crushed. Where do you think the stock trades at year end? You, sir, are far too generous. How can it be that I, a simple amateur investor, saw three red flags when I first looked at VRX but Ackman and other pros (including the sober minded Lou Simpson) failed to see or process: 1. an acquisition binge that would have warmed the cold hearted hearts of Bluhdorn, Riklis, Ling and the other go-go boys from the 60s; 2. a well-known MO of buying pharmas, closing down the labs and jacking up prices to outrageous and unjustifiable levels; and 3. not least in my analyses, a management consulting partner as CEO. Two and twenty doesn't reward like it used to. I remember seeing this ad at a Duke basketball game last year and it stuck me as odd because that scoreboard is not shown on TV coverage. So Valeant was paying for an ad that only 9,000 people in the stadium can see. It makes sense for Coke to pay for it, maybe I get out of my seat and buy one of their products. But how does it help VRX for a Duke fan to see that ad? Will I pull out my phone mid-game and look up their company? Its one thing for Pearson to give personally to his alma mater, but using company funds to put up an in-stadium ad never made sense to me. "Mike Pearson lied in the conference call. This seems beyond dispute. Just compare the quotes." Actually, if you cared about things like, um, facts, you would be compelled to point out that the Howard Schiller email was sent SEVERAL WEEKS AFTER THE CONFERENCE CALL in which Pearson made his statement. So, Pearson actually didn't lie on the call, as you claim - unless he had a time machine and travelled backwards in time to go on the call. Pearson may, of course, have simply been referring to the top 20 products, which were volume-driven rather than growth-driven. But all of that is ancient history at this point. What matters is the future - and the future looks increasingly bright for VRX (see, e.g., Walgreen's agreement - notice you have studiously avoided mentioning THAT ONE!!! ).